Tinderbox User-to-User Forum (for formal tech support please email: info@eastgate.com) - Columns functionality? Tinderbox User-to-User Forum (for formal tech support please email: info@eastgate.com) › Tinderbox Users › Moving to Tinderbox 6 › Columns functionality? I miss columns. Is there something comparable in TBX 6? I'd like to see all the (in this case) HTMLExportTemplate values for all the notes in an outline, so I can easily see which are wrong and fix them...without having to scroll through each note while in the inspector. Can something like that be done? then you can click on the headings to chose the attribute to display. However, I don't know enough about TB to know if this helps. Thanks Graham. You understood perfectly! I just didn't know this was how to do it. I always used Ctl-click in TBX 5. Yes, columns are very much a part of TB6, and actually work better and more flexibly in my experience. And, if you haven't tried the Attribute Browser, I think you are in for a happy surprise there. Especially in its combinations with (a) columns of its own and (b) various queries and filters. well, I found a columns problem, I think. How do I add more than one column? The View tab only turns columns on or off. Left click in the column area no longer lets me add another column, or select which attribute should be displayed. Graham, this is just an explicit ^like^ for your last post. I'm always slightly worried that my hate of seeing request for help seeing unanswered (scars or forums elsewhere) means I may chip in early and discourage others. More voices welcomed, concordance not required. Graham, this is just an explicit ^like^ for your last post. I get a lot of help from forums, so on the rare occasion I can "give something back" I try to. But thanks you for your like. well, I found a columns problem, I think. How do I add more than one column? On the same bar that shows the name of an existing column, there is a little Plus sign + over on the left. You click that. Controls for columns are not shown until you turn on column view via View menu -> Use Columns. On doing that the column header bare is shown with two controls as shown. 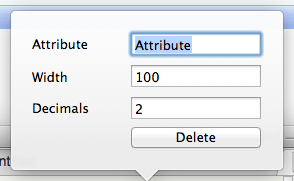 The 'Attribute' box allows you to set the name of an existing system or user attribute. As you type auto-complete will suggest possible matching attribute names. The 'Width' box sets the column allows you so set the column width in pixels. Default is 100 but columns can be dragged wider/narrower via their right-hand column divider. The 'Decimals' box applies only to Number-type attributes and sets the number of decimal places to be displayed by numbers in the column. Default is 2. Bumping with a related question. Is there a setting or attribute to make new outline windows to always open with columns enabled?